It’s that time again, so grab your Bible and crack it open! Get ready to learn about the story of Moses and the Israelites; one of valiance, triumph, and mass genocide. If you liked this video, be sure to let me know in the comments below. Peace be with you. So….. Your title say “Bible study”, but you don’t actually read or quote any specific verses of the Bible. You’re not funny, even if you think you are. You do realize that The law not to murder was placed on man since the beginning. Why do you think God punishes Cain in Gen 4 for killing Abel? We don’t need to hear God’s law to be held accountable to it read Romans 2:15. I thought this was with a atheist AI not AL. I wanted snark from Watson. I’d be interested to hear Al’s take on other bible stories. A bush? George is that you? As a Christian this video was hard to watch. 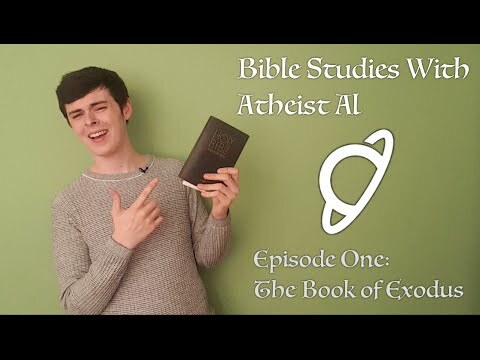 I realize this video was meant to entertain the atheist and anti-theist following you have on this channel so I will refrain from any corrections I feel could be said because I know this not the most ideal debate platform. But I will say that I wish more Christians would watch videos like this and actually think about the inconsistencies and “ridiculous” stories presented. Christians (and any theists really) who don’t question and think and research about their own faith can cause too much damage to be ignored. I really enjoyed your radio debate with Frank Turek. I hope to see you in more debates in the future. Are you going to do any mlore books of the bible? I love this! You should do bible study all the time! That is the type of bible study I could listen to every day! Lol!